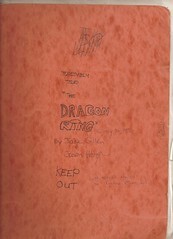 This is the cover of the (hand written) novel Jake G and I started during the 8th grade. It was about a British military officer named John Crimson, who is sent to India to solve a murder against the backdrop of the fall of the British Empire there (I'm not kidding.. we were clever little bastards!). The "Dragon Ring" is the fraternity of assassins he uncovers. We got about 60 pages written before summer started and other priorities took over (D&D, ahem). Jake found it in a box in his garage last year and was kind enough to give it to me. Perhaps I should pick this project back up... hmmm..
Was this the one I started typing for you? Yup, that's the one! You can even see "special thanks to Danny McDowell" on the cover.